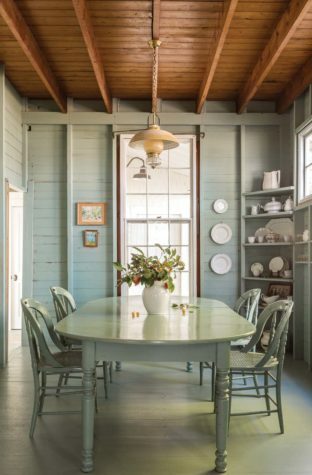 The original summer dining room has exposed framing and inherited furniture, as well as ironstone china on the walls and an open corner shelf. All the paintings in the old part of the house were done by Heather Holmes Floyd’s grandmother, Catharine Holmes. The paint on the floor and furniture is new but true to the original colors. Bill Floyd and Heather Holmes Floyd sit with their eldest son, Henry, on the summer porch with white wicker furniture that dates to the days when Heather’s grandparents lived in the house. Casco Bay is in the background. The open living and kitchen area in the new house is outfitted with blue stools. The link that joins the new part of the house to the old is on the right. The materials here—stone tile and walls of nickel gap and cedar shingle—suggest what might have been on the outside of the house, if there had been an actual gap between separate new and old buildings. The space is covered with a glass roof framed with reclaimed heart pine. The lighting throughout the house is from Fogg Lighting. The framed flags on the kitchen wall are from the Mere Point Yacht Club and the Portland Yacht Club. The family’s dog, Popham (named after the beach), wanders between the new and old parts of the house. 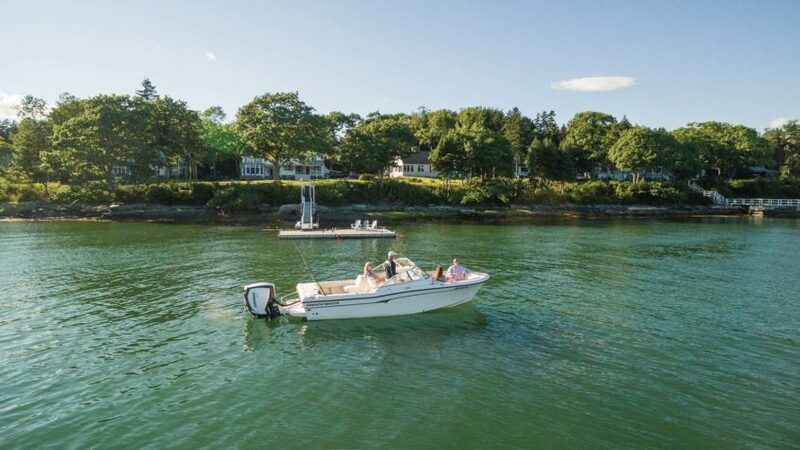 The family’s Grady-White boat on Casco Bay. Behind the boat is their dock. The living room has a raised-hearth fireplace that allows for wood storage underneath. The mantel is made of the same reclaimed heart pine that frames the glass roof linking the old and new parts of the house. The rug is seagrass. 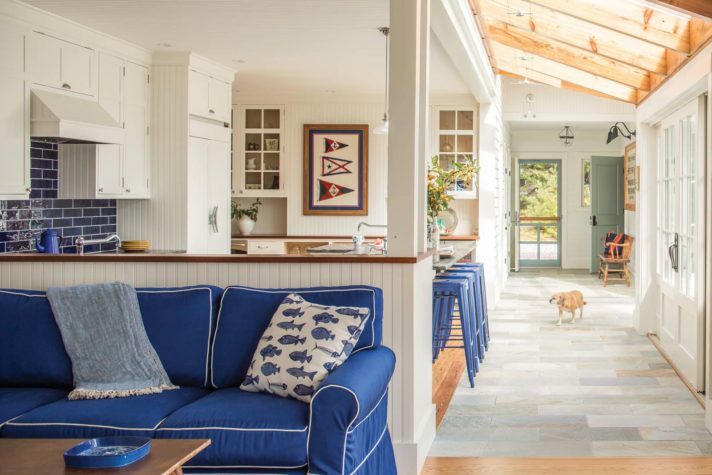 For the interior design, Heather consciously chose Maine materials whenever she could, selecting reclaimed barn wood for flooring and a gray-green Norumbega stone for the kitchen countertops and island. She is shown here to the far left with Henry, her eldest son; friend Kat Shortsleeve; and her husband, Bill Floyd. Their dog Goose is named for Lower Goose Island. 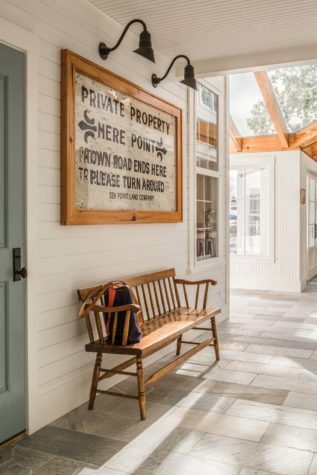 A weathered “Private Property” sign, which hangs on the wall in the link between the old and new part of the house, is a nod to the past and the Floyds’ engagement with it. One day, when Bill was collecting wood for a community bonfire, Heather’s grandmother gave him the sign, which had been stored in her basement. Rather than throw it into the fire, Bill gave it to the Mere Point Yacht Club. It hung on the club’s walls for years, but then one day Heather saw it in a junk truck, ready to be thrown out again. She rescued it for a second time and framed it for her house. Max Zachau is responsible for built-ins throughout the house, including this pantry located in a corridor wall behind the kitchen. Part of the wood was painted white and part left natural. A new staircase with a lighthouse-shaped newel. The rope that serves as a stair handhold in the original house inspired the rope detail here. A guest bedroom on the ground floor. The central room of the old part of the house has original furniture from Heather’s grandparents’ day. The extra-wide pine boards on the walls have a triple-bead profile where board meets board. Through the door and window, you can see the indoor “link” that leads to the new part of the house. What appears to be a transom window above the door is a window original to the house, now rotated on its side. For structural reasons, the original chimney had to be removed. A cabinet covers the space where the firebox once was. The original mantel can still be seen above. In 1943, when Catharine Rollins Holmes and Herbert Shepard Holmes bought an 1885 summer cottage on the tip of Mere Point in Brunswick, the official paperwork said that the “lot and creators thereon shall never be used for keeping a hotel, boarding house, saloon, or other place of public entertainment.” These conditions were (happily) not honored, according to a history of Mere Point from 1878 to 2003, but that claim is half tonguein- cheek. While there was never a business on the property, the family did like to entertain. Keeping to tradition, Catharine and Herbert’s granddaughter, Heather Holmes Floyd, and her husband, Bill Floyd, tend to the convivial. The Holmes cottage, which they now own, is part of a picturesque summer colony with families so tightly knit that neighbors routinely joke that they have already selected their children’s spouses from one another’s offspring. Friends are in and out of each other’s houses all day, and residents rarely publicly sell their homes, instead passing them from one generation to the next. As far as Bill Floyd knows, the last time one of the 50 or so houses in the community actually came on the open market was 1976. 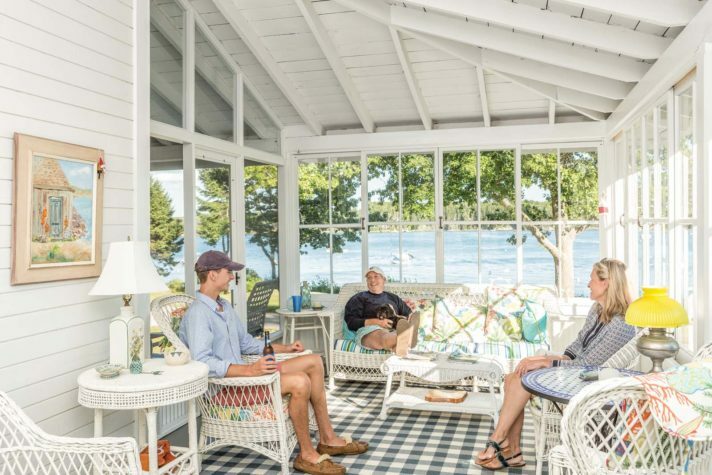 In addition to the closely connected community, Heather and Bill have always loved their cottage itself, which remains much as it was in Heather’s grandparents’ day. On the exterior, it is classically charming, with hydrangeas clustered at the base of a deep sitting porch out front and a glassed-in sunporch furnished with the grandparents’ white wicker. Inside, the rooms have wood floors and exposed stud walls, often of dark weathered pine but sometimes painted, such as the dining room, which is a light green and has an open corner shelf with ironstone china. 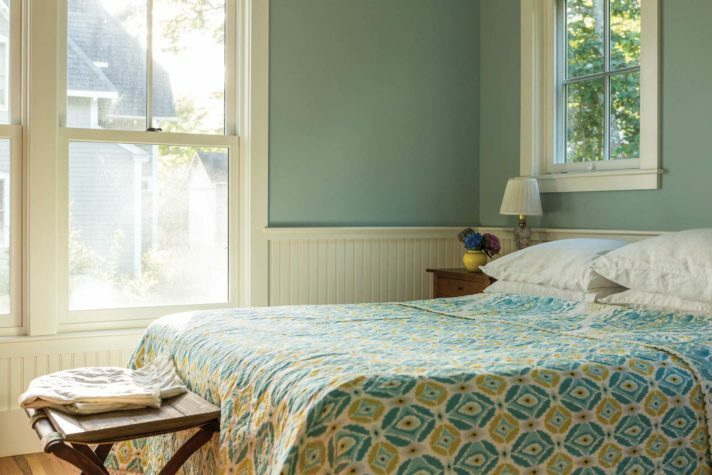 The four small upstairs bedrooms—one furnished with sleigh beds, another with an antique brass bed—each has a makeshift closet of colorful fabric curtains, behind which hide hooks with hangers. Paintings, often of Mere Point and always by Catharine, hang on the walls. Everything is old-fashioned and, for Heather and Bill, perfect. Except in winter. This has always been the downside of the cottage: it is often cold. More and more over time, Heather and Bill, who are based in Massachusetts, wanted to visit Maine year-round. However, they knew there was no way to winterize the summer cottage without doing damage to its historical character. 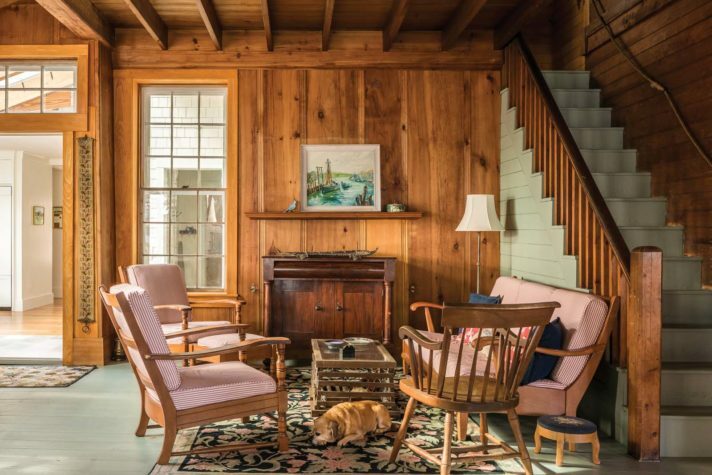 The cottage’s interior and exterior walls were one and the same; insulation and a heating system could not be added without covering up something that the entire family loved. Heather and Bill might have been permanently stumped by their conflicting desires, if not for Winkelman Architecture in Portland. Architect Will Winkelman and lead designer Melissa Andrews, along with support staff architect Brian Stephens, came up with an unconventional “have your cake and eat it too” solution, which Dana Smith of Coastal Carpentry in Brunswick then built. The plan left the original cottage more or less intact and added a contemporary wing with an open living/ kitchen/dining room and four new bedrooms, two en suite. In the summer, the whole house, now expanded to eight bedrooms, can be used. In the winter, the old cottage can be closed off for comfortable living in the new portion. As built, the old cottage and the new home seem like the same building on the exterior. 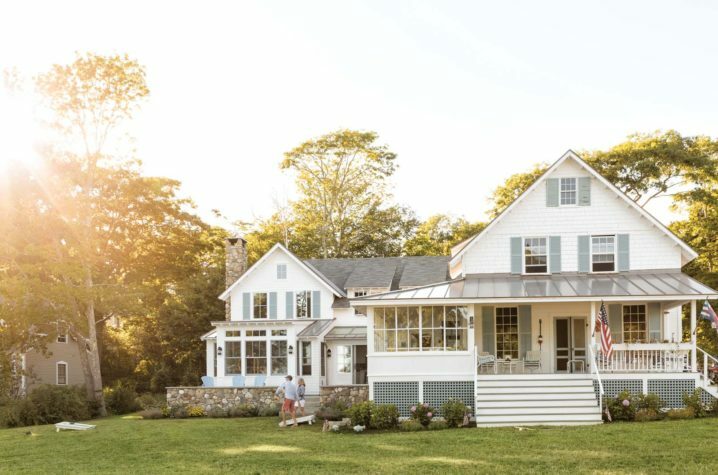 The addition is cottage-style and complementary to the original, with similar roof forms, fenestration, shutters, exposed rafter tails, and shingling. A terrace defined by a stone wall in front of the new house balances the original front porch, which is situated over more traditional wood lattice work. Inside, however, old and new are distinctly different. 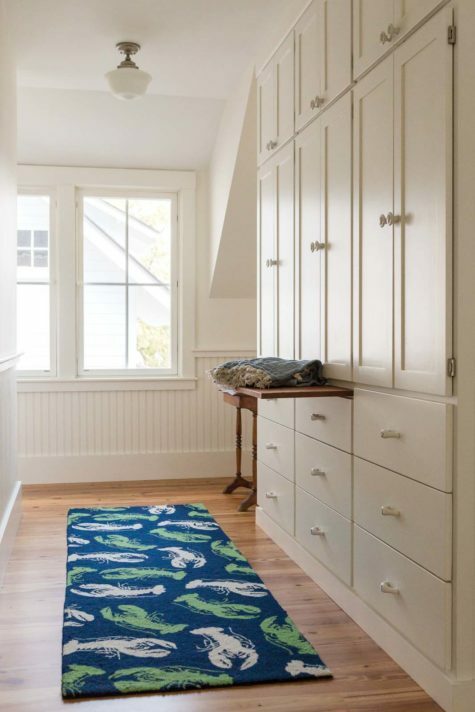 The new part of the house is light and airy with white walls, beadboard, and blue accents. Bathrooms and kitchen are full of modern conveniences, and a room off one hallway serves as laptop nook and charging station. “It’s like going from black-and-white to color in The Wizard of Oz,” says Bill of the transition between the two parts of the house. When it came time to tell Winkelman Architecture what he hoped for in the addition, Bill said he wanted to be able to make a turkey for Thanksgiving dinner in the kitchen and simultaneously see the dining room table, the ocean, the Macy’s Thanksgiving Day parade, and a fire in the fireplace. 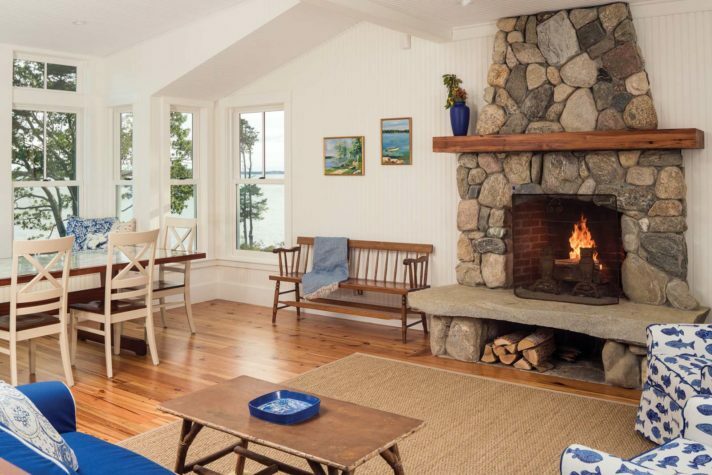 And, indeed, now Bill can truss a turkey and do all that, as the view from the kitchen island is to the dining room with its large ocean-facing windows and to the living room, which has a TV (rising on a lift from a built-in cabinet) and a raised-hearth fieldstone chimney. The latter replaces an item that was lost in the renovation—the original cottage’s brick chimney, which could not be stabilized when Smith built a foundation to replace the posts on which the cottage was originally built. Ordinarily, to shoehorn a new foundation under an existing house, Smith would lift the house, place it on adjacent land, and lay the foundation, but the cottages on this side of Mere Point are clustered tightly together. Smith had to lift the home and have his workers “hammer ledge with a building hovering above them,” he says. 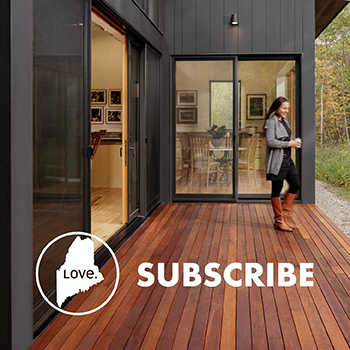 Easily one of the most unique parts of the home is the “link porch,” which is an L-shaped space that marks the transition from the old home to the addition. It’s an indoor space suggestive of an outdoor space, capped by a glass ceiling framed with reclaimed heart pine timbers and floored with stone tile similar to what you might see on an outdoor patio. “We wanted it to feel like two separate buildings linked by a porch,” says Andrews. To this end, the walls are finished in the same white cedar shingles and white nickel gap used on the exterior walls of the original cottage. Heather was largely in charge of the interior design, although she had help from friends within the Mere Point community. 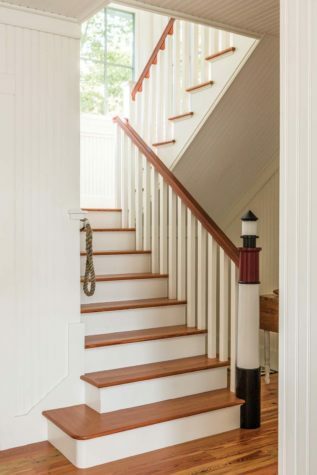 In the new part of the house, she kept to a nautical theme, using boat cleats for refrigerator handles, Company C rugs with lobster silhouettes for the halls, framed yacht flags in the kitchen, and a rope banister for the stairway, which has a lighthouse-shaped newel fashioned by Fat Andy’s Hardwood in North Yarmouth. 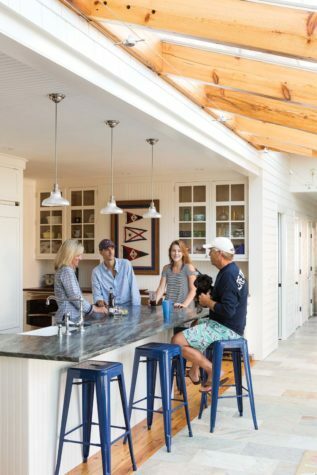 The most unusual nautical detail was inspired by Heather and her sister Bethany’s teen years waitressing at a Falmouth restaurant whose tables were topped by nautical charts. 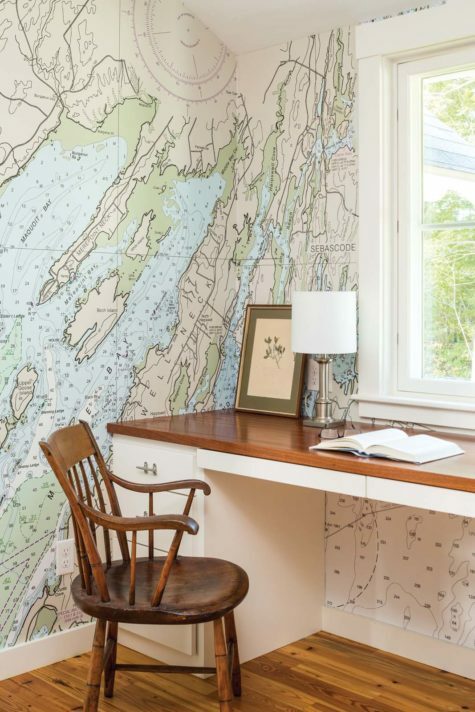 Winkelman turned nautical charts of Casco Bay into wallpaper to line the walls of the study and powder room and also to cover the top of the dining room table. (For the table, the chart was glued down then coated with liquid acrylic resin.) Now, when Heather and Bill bring that Thanksgiving turkey to the dining room table, they can look down and see a cartographer’s view of what is out the window. The chart wallpaper has one small addition: a red dot that represents Winkelman’s own home on Peaks Island. It’s a wink of the eye from the staff in Winkelman’s office. Builder Dana Smith, who also lives on Mere Point, might be one of the many friends and family members who come in and out of Heather and Bill’s house on a given day, partaking in whatever “public entertainment” is on offer. Winkelman, Andrews, and their associates are farther afield, but the map serves as reminder: they are there all the same. The upstairs office has a built-in desk by Max Zachau and wallpaper that Winkelman Architecture designed from charts of Casco Bay. The design team also used the wallpaper for the downstairs powder room and the top of the dining room table. 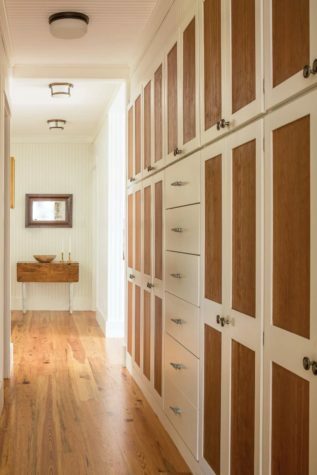 For an upstairs built-in linen cabinet, Zachau replicated the exact cabinets that Heather and Bill had seen in a home in Rye, New York. A pull-out shelf is intended for folding laundry. The hall rug with lobster silhouettes is from Company C and the window is Marvin. 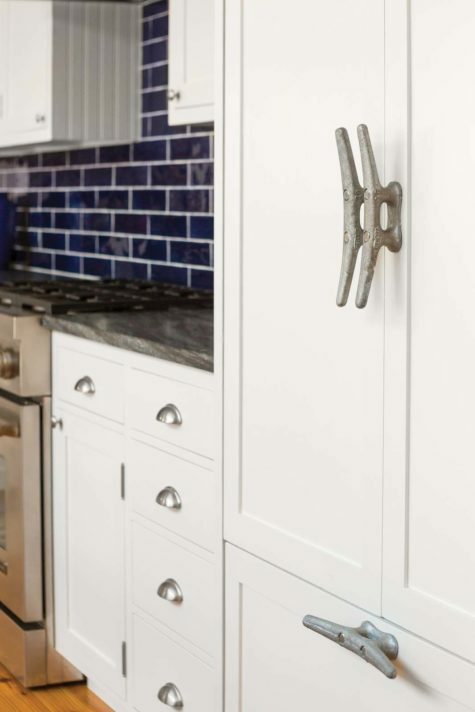 The refrigerator handles are boat cleats, which keeps with the nautical theme in the new part of the house.